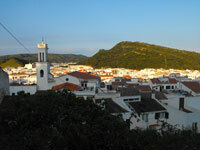 Surrounded by rolling green hills, the 13th-century town of Ferreries lies nestled in the centre of Minorca, next to the island's second highest mountain. It is the highest town on the island. Travellers are attracted to the area by the Castell de Santa Agueda, the ruin of a Moorish castle, built atop an ancient Roman stronghold, which was the last site of resistance for Arab inhabitants when the island was conquered by King Alfonso III of Aragon. The ruined fortress is accessed via an ancient Roman road and there is a chapel dedicated to Saint Agatha next to the castle. Ferreries itself is a sleepy little place, with a character typical of the island. With orange tiled roofs and pokey, narrow streets, this little town may not be an obvious attraction, but it's natural charm and location make it a great place to stop and see how real locals live. A farmer's market is held in the town every Tuesday and Friday which attracts locals from all over Minorca, and is a great place to buy local produce (the region is particularly celebrated for its cheeses). Ferreries is only a short, 30-minute drive from the airport and is a good starting point for walking tours of the island.